Swan Nautor yachts, European Championship, off Guernsey. 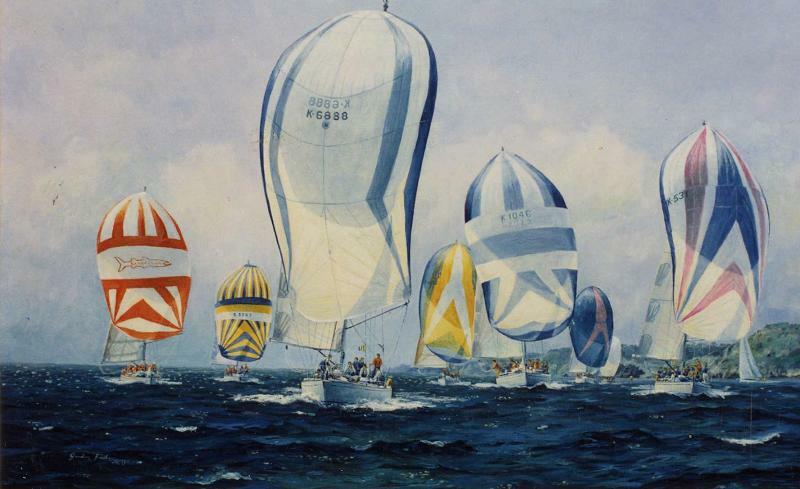 By Gordon Frickers 50 x 81 cms (20″ x 32″), oils, original commissioned by Yachting World as their first prize. “I have won a few prizes in my racing career but I can assure you this will be one I treasure most“, M.J. Leadbetter. A Nautor Swan Prize, see Alvine XII and Yachting World, the story here is similar, the year different, the location, Guernsey, Channel Islands. Yachting World asked me to fly out for 3 days on the location to prepare to paint, watch the yachts, study form and pre plan how I would work. On the day of the Yachting World prize race I prepared a water colour, adding the winning yacht after the handicaps had been worked out. The picture was quickly mounted and framed for presentation at 18.30 that evening. 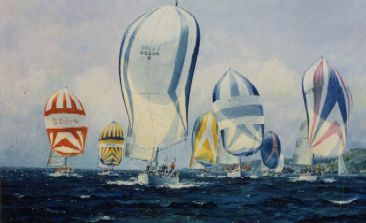 The oil painting above was developed later and presented to Mr. Leadbetter at the London International Boat Show by the editor of Yachting World, Andrew Bray. An amusing job, quite demanding was immediately followed by another amusing task, less demanding, positively luxurious by any measure. From Guernsey I flew direct to Southampton to be a celebrity guest of Cunard Line for a cruise on the QE2. During the cruise I gave a talk and demonstrated marine painting by producing “The Sirius” (https://www.frickers.co.uk/art/marine-art/sirius-and-the-blue-ribband-of-the-atlantic/). Cunard generously invited my wife and placed us in one of the best cabins, dinning us in the Queen’s Grill, the best restaurant on the ship, thank you Cunard staff, for a memorable voyage.